As we have been enjoying amazing scenes from Sochi, Russia where disabled athletes have been completing in the winter Paralympics, researchers in Switzerland have been considering a new route for athletes for whom normal devices such as prosthetic feet and modified wheelchairs are not suitable. 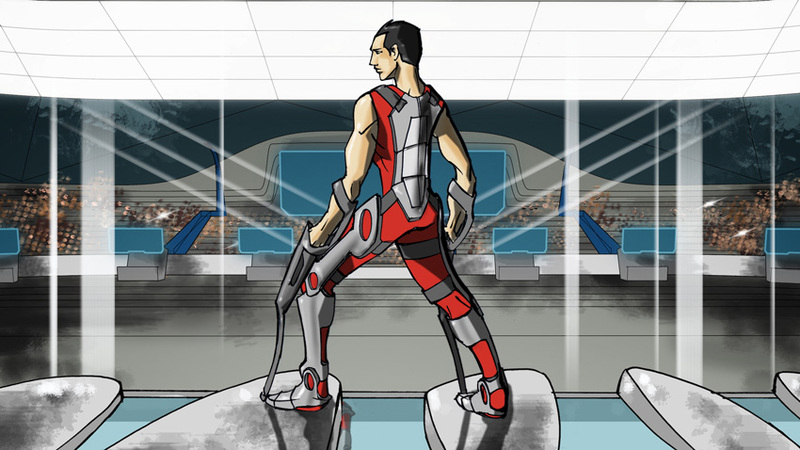 For these athletes, robotic technology that can interface with the user, such as powered exoskeletons, may be better adapted to allow fair and exciting competitions. Brain Computer Interface (BCI) race: BCIs will be used to enable pilots to control avatars in a racing game on a computer screen. Functional Electrical Stimulation (FES) bike race: FES devices will be used to help pilots with complete spinal chord injuries to perform pedaling movements, thus enabling a short bike race to take place on a circular track. Leg prosthetics race: Amputees fitted with actuated exoprosthetic devices will compete in a short obstacle course. Powered exoskeleton race: Actuated exoskeleton devices will enable pilots with complete spinal chord injuries to complete a short obstacle course. Powered wheelchair race: Pilots will steer powered wheelchairs around an obstacle course. Arm prosthetics race: Actuated exoprosthetic hands and arms will be used by pilots to complete a coordination race. Each race has its own set course complete with obstacles and activities (e.g. sitting and standing) that have been specially designed to test the compatibility of prosthetics with their pilot. Teams will work together in advance of the race to create assistive devices that are functional and practical for the specially designed courses, and it is hoped that not only will the event deepen relations between the disabled and research robotics community, but also strengthen ties between research in industry and academia. This event will open up athletics to individuals who had previously been barred by the rules governing prosthetics in international sport. One key group are those suffering from motor conditions where reflexes and control of limbs may not be sufficient to allow individuals to have the competitive edge over rivals. To enable participation of this group any robotic assistance is allowed, the only limits are that devices must be controlled by the wearer and carry their own power supply. Sport is commonly understood to be a great unifier, and the organisers at NCCR Robotics in Switzerland see no reason why this can’t be extended to groups who have not been previously included. Register to become a pilot or technological team and learn all the details on the Cybathlon website. or see the Cybathlon’s Facebook for regular updates. Please note that pilots and technological teams do not need to know each other before the competition – organisers will pair up those who enter alone. Bursaries covering travel expenses will be made available for pilots and academic teams on application. Robot Launch 2014: The first global startup competition for robotics is here!